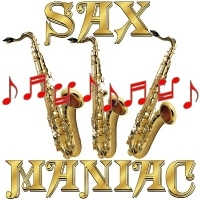 This bold and brassy “Sax Maniac” design is for anyone who loves to play or listen to the saxophone. There are three glistening instruments with red musical notes floating between them, and bright golden text to match. Find the perfect gift for your favorite saxophonist or sax lover, be it on apparel or a mug or something else. Or buy something for yourself! Perhaps you’d like to also look at our other saxophone-related gifts we have to offer.